The Tesla Model S is the car that changed the world view of this crazy start-up in Palo Alto. The Roadster was a reworked Lotus Elise, but the Model S was Tesla’s first ‘proper car’. It transformed Elon Musk’s company from an insignificant speck on the automotive map into a global superpower. Tesla Model S deliveries started in December 2014. The prototype went on show in 2009, so it took five years to bring this revolutionary electric car to the market. When it arrived, it did so with a bang and made the traditional motoring world look like a dinosaur in the process. It has taken time, but the Model S now makes up the majority of the 2000 cars Tesla produces each and every week. That has fueled the supercharger network program and turned the company from a curiosity into a mainstream manufacturer. It’s a premium car that can almost drive itself. In Model S P90D spec, it’s a supercar slayer, but until the Model 3 arrives it is also the company’s big seller. Here is everything you need to know about the Tesla Model S.
The Tesla Model S is a groundbreaking car, so perhaps the most surprising thing is that it looks so inconspicuous. Even the major marques have taken the chance to go nuts with their electric and hybrid car designs. Tesla had no over-riding corporate culture. It was free to rip up the rulebook. It didn’t, at all. The Model S is clean-cut, simple even, and visually it has about as much charisma as any number of mid-range executive cars on the market right now. It’s elegant, but that’s all. The fastback design has become a Tesla calling card and it does look strong, but there’s no possibly way you can call it flamboyant. Then again it’s a serious car that made Tesla’s mark, so maybe we shouldn’t ask for bells and whistles. With the battery packs stowed in the floor and a wheel at each corner, it’s a solid car with the weight low down and the biggest footprint possible for the best handling characteristics. It also blew the motoring press away with its quality. It’s a solid car, looks wise, but the magic all happens under the skin. Again, it’s clean cut and simple, but with the interior it works. The Tesla Model S interior showed us a whole new approach to car design. While the other premium marques have dressed their dashboards in buttons, dials and switches, the Model S gets a touchscreen. 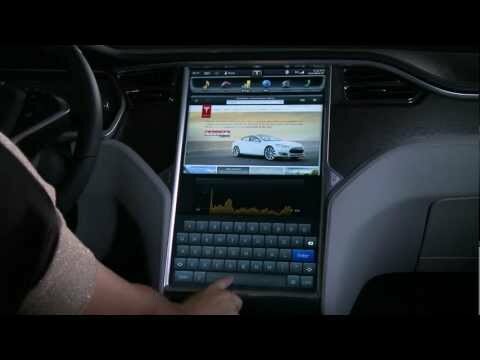 That one 17” tablet gives you access to the Tesla Model S in car entertainment, internet access, charge information, climate control, sunroof, suspension, navigation and just about everything else. This isn’t just an onboard computer; it’s a command center. This one screen is a quantum leap forward for car interiors and it is already having an impact on the competition. Every other car on the market suddenly looks hopelessly out of date and it’s a fair bet that the rest of the industry had this touchscreen under the microscope before Christmas 2014. Elsewhere, the Model S comes equipped with four seats that could star in a boardroom and the quality of the fit and finish is on a par with almost anything on the market. The Tesla Model S panoramic roof adds structural rigidity without the weight of an additional panel and lets the light flood in to the car too. The Model S has evolved since its introduction, but the basics remain the same and you can order one of four wildly different specs that are defined by the battery size. The Tesla Model S P60D is the entry level model with the 60kWh battery, but even that hits 60mph in 5.2s and a top speed of 130mph. With 387lb/ft of torque it comes with 259bp front and rear in the all-wheel-drive variant, although the final output is restricted to 328bhp. You can order a rear-drive version, too, with a maximum output of 315bhp and a 0-60mph time that is 0.3s slower. It’s 218-mile range should be more than enough for most daily commutes, but it isn’t a big seller. The Tesla Model S 75D is the next step up the ladder, but really the big difference with the 75kWh battery is the range. The 75D offers 259 miles between charges, a 140mph top end speed and it comes with a rear-drive option, too. Go for the rear drive car and you can get less power, less speed and less range, but more fun behind the wheel. That’s a personal choice. Yes, we’ve skipped the 85D. The mid-range Tesla, the most popular model, is gone. In its place is the 90D with the bigger battery. You can only have the Tesla Model S 90D with all-wheel-drive and you’ll get 417bhp of limited output from two motors that are independently capable of 259bhp each. That stacks up to a 0-60mph time of 4.2s, 485lb/ft of torque and a 155mph top end speed. It also returns 294 miles on a charge. This is where things get really serious. The Tesla Model S P90D power figures of 503bhp at the rear and 259bhp at the front is supposedly just too much for the public road, so Tesla claims it has limited the final output on this all-wheel-drive beast to ‘just’ 463bhp. It comes with a torque figure of 713lb/ft, a top speed of 155mph and a 0-60mph time of 3.1s. But there’s something you can do about that. It isn’t official yet, but the 100kWh Tesla Model S P100D is coming. That may be the end of the P90D, but when the new car comes we just won’t care. This will be a faster car with 380 miles of range. Of course, we are struggling to comprehend how it can get much faster off the line, eventually the tires will be the limiting factor. But we know this car is going to blow the doors off established hypercars and that is something we cannot wait to see. There are eulogies to the Tesla Model S P90D performance all over the internet. If you get tired of watching an all-electric sedan with a slightly sporting look trample supercars from a standing start, then you’re tired of life. With Ludicrous Mode in full effect, the Tesla Model S P90D 0-60mph time and top speed is absolutely frightening. It hits 60mph in 2.8s and has done 2.6s in independent tests, which is better than almost everything on the road today. It’s superbike fast and only the likes of the Bugatti Chiron or possibly the McLaren P1 can hang with it. That’s not just ludicrous, it’s insane. The Tesla Model S P90D has recorded quarter-mile drag strip times of 10.8s, crossing the line at 122.7mph. It has broken the 100mph mark in just 7 seconds. That isn’t just fast for a sedan, or an electric car, it’s just crazy fast. We’ve already touched on the Tesla Model S range and the simple fact is that it depends on the spec. But the likes of Ford are struggling to crack 100 miles, while Chevy is proudly proclaiming it will have a 200-mile EV by the end of the year and BMW still relies on a hybrid. The fact that the base model Tesla Model S does 218 miles on a single charge and the range topper gives 270 miles is a modern day miracle. Hit the Tesla Supercharger station and you can have 170 miles of range within 30 minutes and the network is spreading like wildfire. It has to, Tesla has to have the infrastructure in place for the mass market Model 3. So pretty soon you’ll be able to drive across North America and Europe with just the odd coffee and bathroom stop along the way. If there’s one feature that divides the world it’s the Tesla Model S Autopilot function. It’s the precursor to the full autonomous, Level 5, self-driving car that should be with us as early as next year. Right now the Tesla Model S Autopilot is designed to take the load off on the highway and to keep you out of harm’s way in the event of an impending collision. Several radars combine with a forward-looking camera, long-range ultrasonic sensors that can scan 16 feet in any direction and a braking assist system. It can detect other cars and pedestrians. It can also execute lane changes, control your highway speed in relation to other cars and park for you. It’s a game-changing system, but it isn’t perfect. It has been connected to at least one fatality, although the driver was reportedly watching a movie when his car failed to spot the truck turning in front of him. There have been several other crashes, too. But Tesla always said it was there to help the driver, not replace them. Elon Musk insists that Autopilot is twice as safe as having a human behind the wheel and it may have already saved at least one life, but the company is working tirelessly on perfecting the technology. Other manufacturers opted to keep their own self-driving systems out of the public eye, but Tesla chose to learn the hard way. The payoff will be millions of miles of real-world driving data that should give the Fremont company a competitive advantage with the full autonomous system. Time will tell. This is a premium car and the Tesla Model S price reflects that fact. But this is a car for early adopters and there simply isn’t anything else like it. Limited edition offerings from the likes of Mercedes, with the SLS AMG Electric Drive, cost almost five times the price, too. The Tesla Model S is a much more complete car. The base model starts from $71,200 and you’ll pay $119,500 for the top of the range Tesla Model S P90D. Then you can tack on $10,000 for the Ludicrous Mode that will turn the Model S P90D into a monster. The Tesla Model S might just be the best car on the market right now. Forget the best electric car, it really could be the most complete luxury sedan you can buy. The world laughed at Elon Musk before the launch of the Tesla Model S. It isn’t laughing anymore. We’re still waiting for the affordable Model 3, but the premium Tesla Model S has raised the bar and forced the world’s biggest car manufacturers to come back with electric plans of their own. It really is a landmark moment, a piece of history and a truly stunning car. The future of automotive transportation is electric. Tesla's crossover is coming in late 2020 starting at $39,000. Following "close evaluation," Tesla announced it is now keeping open significantly more stores than previously announced. What's going on? The Tesla Model S's biggest rival could come from within. How does the Tesla Model 3 compare when it comes to power, speed, price, performance and more? The Tesla Model Y has been under wraps for quite some time, but it may not be too much longer before we get more information about the upcoming EV.